Syma X20 Drone Review 2019 – is the Syma X20 quadcopter worth the money? Review of features, pricing, flight duration, battery, camera and more. The Syma X20 Drone offers an attractive design with clean lines. It has no sharp edges but rather a round shape to reduce friction with the wind and facilitate its flight. The body is entirely composed of ABS plastic to make it resistant to shocks and bad weather. The wingspan of the drone is close to four inches and it has a height of only 0.9 inches. It is, therefore, a flying midge, which rests on four short feet located under the engines. Although it is mainly an indoor flight drone, the Syma X20 drone still has many important features to keep everyone safe even when you decide to try it outdoors. If the drone gets entangled in the branches of a tree or other obstacle, the automatic shut-off function will allow you to retrieve it without any damage to the engine or propellers. The drone is particularly suitable for children thanks to the ease of controls. Users can take off or land the quadcopter by simultaneously pressing two buttons on the front of the remote control. You can make perform acrobatics (like a 360 degrees somersault) by pressing a button on the remote control. Also, it is possible to activate the Hover mode, which allows the quadrocopter to remain stationary in mid-air allowing you to even remove hands from the radio control. If you want to try flying in the evening or in a dimly lit space, the quadrocopter is visible in the dark thanks to four bright LEDs mounted under the belly. There are two in front and two red LEDs at the back. Once the X20 is mid-air, the device is extremely handy thanks to its lightness, The rounded body causes less friction with the air, thus enhancing flight characteristics. The engines work optimally, which contributes to superb performance both in terms of stability and control. All of this translates to better battery performance, which allows you to extend the flight time. In addition, the quadrocopter can fly at two predefined speeds: slow and fast. This enables beginners and children to focus exclusively on piloting the drone. It becomes easier to feel confident flying the machine without constantly thinking about accelerating or slowing down. Do not worry if your Syma X20 suddenly indicates a low battery because the drone will land automatically in complete safety. On the other hand, the product can resist shocks against a wide variety of obstacles. The rounded design and the remote control’s extended range help it to fly steadily up to 76 yards away. 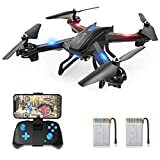 Some of the most interesting functions include automatic take-off and landing, the ability to perform 360-degree flips and the Hover function, which floats the drone in mid-air without having to touch the remote control. The Syma X20 drone is highly recommended for children and beginners. It is a small, manageable, easy to use and a really fun drone. The unit is equipped with a small radio control, which makes it suitable for smaller hands. The drone’s red buttons are more sensitive to pressure than previous versions. The positioning of the keys is aimed at ensuring ease of movement and the drone’s agility. The design also eliminates confusion when you are working on the various functions and acrobatics to make to the quadricopter. The radio control works on the classic 2.4GHz carrier and uses four common AA batteries. 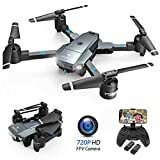 Syma X20 drone customer reviews posted online show that users are impressed by the product’s performance and overall design. Clean lines give it a unique appearance when compared to other drones that are available on the market. Its radio device looks more like a video game controller than a classic drone control. Its hull has a well-finished appearance that looks both sturdy and visually pleasing. When it comes to the drone itself or its radio control, the Syma X20 is distinguished by a clean design. Although this drone is intended for indoor use, many customers are happy to try it outdoors in calm weather. In the air, the device impresses buyers thanks to its stability and resistance to shocks. The altitude hold function allows it to stabilize at the same distance from the ground autonomously without further intervention on the user’s part, which facilitates the handling. 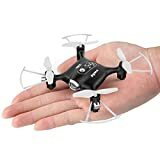 Another feature that is mentioned in the drone customer reviews is the ability to take off and land simply by holding two buttons pressed simultaneously. This function greatly facilitates the piloting of the small gadget and simplifies the learning process for beginners. Both high and low-speed control modes make it possible to switch between two piloting speeds; fast and slow. During the initial flight, it is advisable to test the low-speed mode for a long time to get used to piloting before switching to the high-speed mode. It also comes with a headless mode that is praised by customers. The mode is designed to ensure that the device is easier to control, especially for beginners. Users no longer have to worry about adjusting the position of the drone before flying. The Syma X20 is one of the smallest models on the market and it will surprise you with its complete features offering a remarkably agile but absolutely safe piloting pleasure. The unit is perfectly adapted to beginners thanks to its integrated 6-axis gyroscope stabilizer, which uses the 4-axis structure and the altitude hold function to ensure the stability of the flight. Its key features include fast and slow speed mode, headless mode as well as flip and 3D rolling. This drone is still quite basic compared to other more sophisticated models. 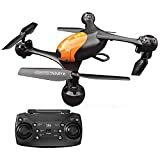 Based upon feedback submitted by over 150 customers the Syma X20 Drone has received a 4 out of 5 star rating. We discuss why in this review article.